Real Madrid star Isco has been linked with both Chelsea and Manchester City amid his ongoing issues at the Bernabeu. The Spain international has struggled under Santiago Solari this season, spending much of the time stuck on the bench. As a result, talk of a move away from Real Madrid has intensified. Chelsea have emerged as potential suitors with Maurizio Sarri needing a replacement for Cesc Fabregas, who moved to Monaco. And Ok Diario director Inda has claimed Isco will be offered to the Blues as part of a transfer that would see Eden Hazard head in the opposite direction. Hazard has long been on their radar, with the Belgium international seen as a potential replacement for Cristiano Ronaldo. 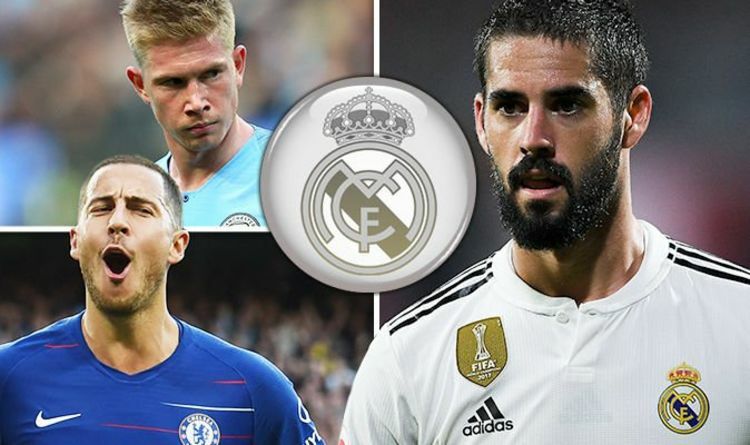 And Inda has also claimed that Manchester City will be offered Isco as part of a swap for Kevin De Bruyne, who has fallen out of favour with Pep Guardiola. “Everyone knows that Guardiola loves Isco and 10 days ago, or less, a person of absolute confidence of the coach called Isco and asked if at this time would be willing to take the step to go to the City,” he said. “The person who called him was Mikel Arteta. “Madrid are going to try to put Isco in the operation for Hazard or in a possible operation with De Bruyne. “In the Bernabeu they say that he will not be sold, but I believe that it will not be for its disaffection with the dome, the coach and the costumes. Former Real Madrid director Jorge Valdano believes his club DO have a major problem with Isco. “A year ago, the great hopes of Real Madrid were Isco and Asensio,” he said. “One has been lost along the way and the other is under observation. “Everyone knows that something is wrong with Isco, but nobody knows what is happening. “It should be solved in private. Cristo Gonzalez played ahead of Isco [against Betis] – this is a serious problem.